remember that time we went to italy last may and I'm just now getting around to blogging about it? yeah, me neither. we're going to go ahead and pretend like i'm not this far behind and instead just reminisce, OK? this one's a doozy so pour yourself some nice italian wine and settle in! 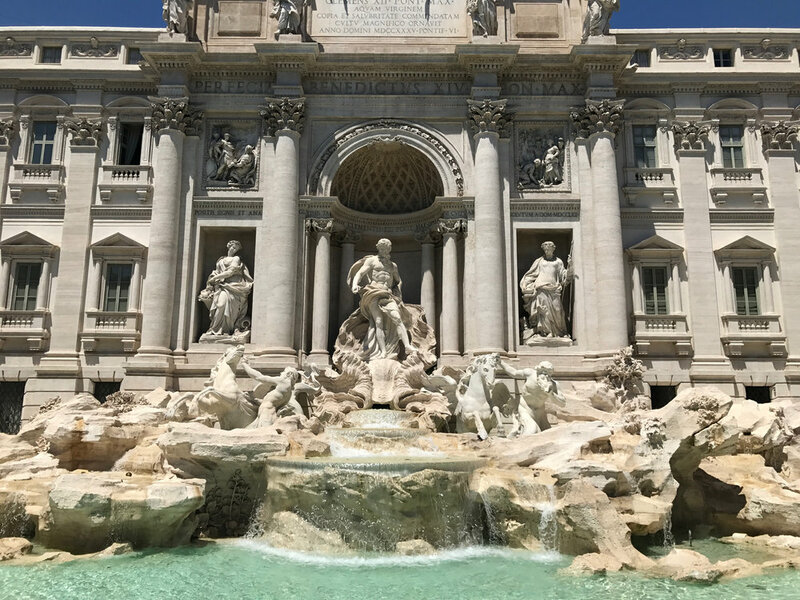 from the minute you land in rome, the first thing you notice is bits of history legitimately around every corner and in nearly every building. no matter if there's a monument or starbucks nearby, everything looks as though it has existed for hundreds of years (and honestly probably has). it makes for striking, almost surreal visuals everywhere you walk. and because almost everything you see has some sort of historical significance, here are some of the things we liked the most. for starters, THIS ^ was our hotel lobby. classic rome, looking all pretty even in the most unlikely places. this was also the hotel where james gandolfini died a few years ago. long live the sopranos! almost every single side street looks like this. are you kidding?? one of the first things we like to do in any new place is venture out from the hotel and see what we run into. 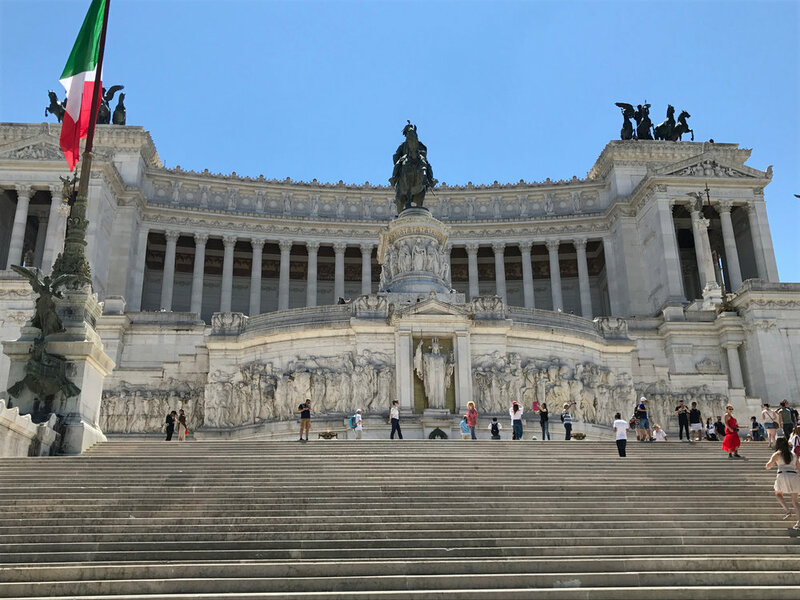 the top photo is the altare della patria, also known as the monumento nazionale a vittorio emanuele II. it took us way too long to figure out what this place was even though it's so majestic and ornate. I feel like most things are so well marked and covered with signage so to not see that was a little strange! 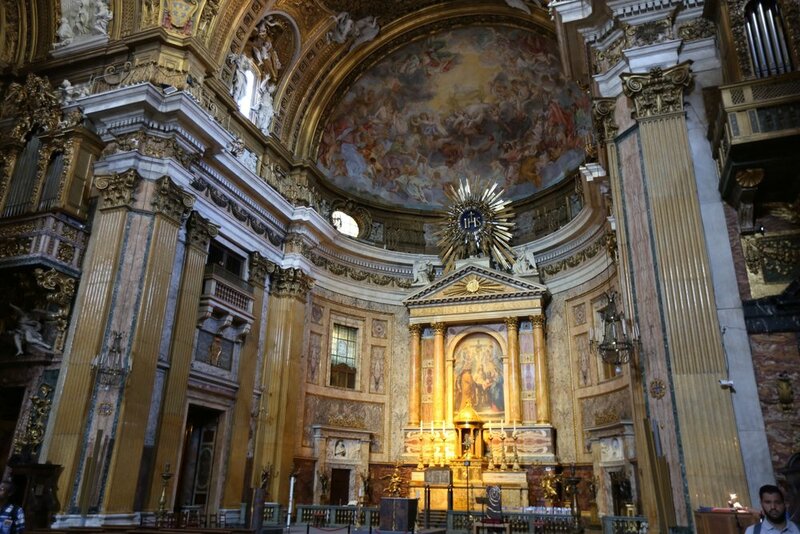 the next two photos are from one of the most stunning buildings in all of rome. it's hard to explain how massive and unique this space is. while it used to be a temple (built around 113 AD, I might add! ), it now functions as a church and tourist attraction mostly. the building was built by hand and the oculus at the top of the church is still the largest unreinforced concrete dome in the world. wowza! ahhh, the trevi fountain - arguably one of the most happenin' tourist spots in the whole city. it took a lot of effort to not have any other people in this photo because there are couples, kids, families and people EV-ERY-WHERE. and people trying to sell you fidget spinners, umbrellas and other knickknacks. long story short...it's an absolute cluster but SO worth seeing. you must at least do a quick walk by. and throw a coin over your right shoulder to ensure that you will once again make it to rome. these are the ruins of caesar's forum. it is just mind-blowing how many of these things are still perfectly preserved and still standing. they just don't make things like they used to. FOOD BREAK! 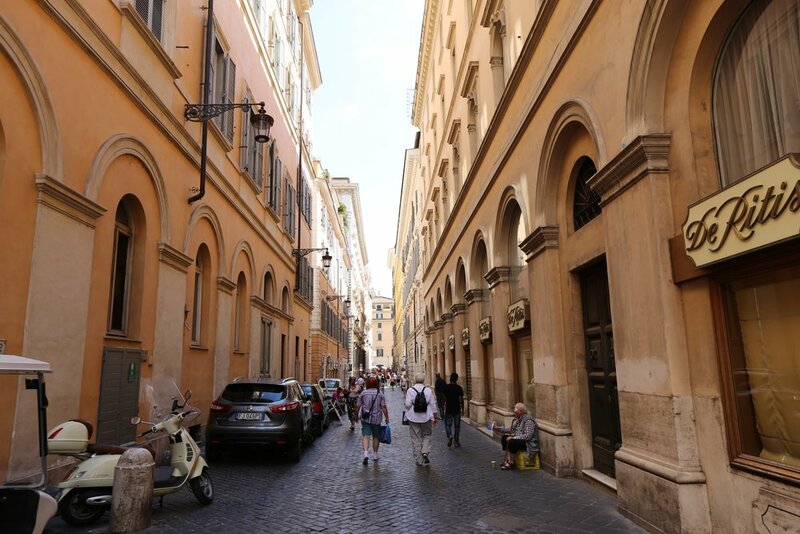 we are going to take a quick detour and check out some of the tasty things we ate in rome. it's essentially impossible to choose the best meal we had because the pasta, pizza and everything is just leaps and bounds better than anything we have in the US. the pictures don't even do it justice, but hey, a girl's gotta try. 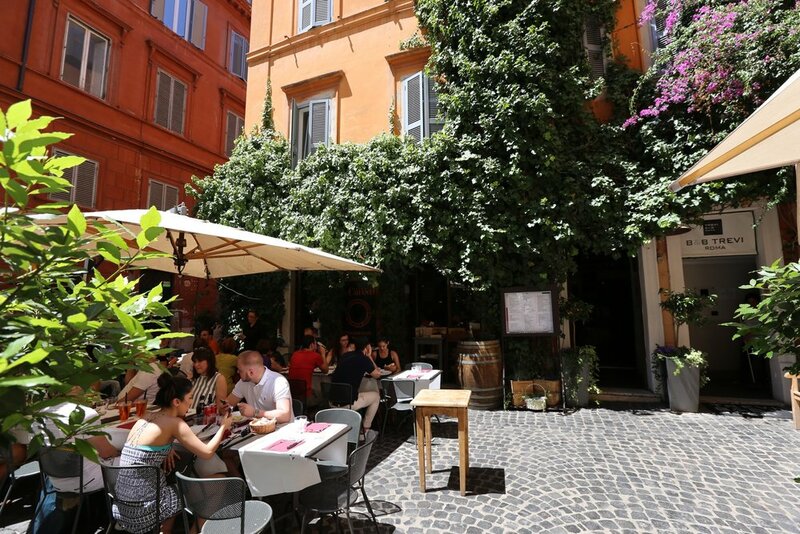 la procutteria trevi was the first place we ate in rome and it did NOT disappoint. build your own charcuterie plate HELLO THANK YOU. it was heaven. this adorable little corner cafe (Il chianti vineria) is a few blocks from the travi fountain, but doesn't feel touristy at all! how can such simple ingredients taste so good together??? this was one of MANY plates of pesto I had during our trip. couldn't get enough! gelato is a daily occurrence. ask anyone. OK, now that we've had a feast...back to our regularly scheduled programming. the next stop on our rome tour is the iconic colosseum. rounding the corner and seeing this was seriously a pinch me moment. learning about the history behind it, how it was built and how it's still standing was just mind-blowing. the tunnels you can see were for the different gladiators and VIP guests to travel through so they wouldn't be seen in the crowd. if walls could talk! this is the arch of constantine, which essentially stands in the shadow of the colosseum. while not as expansive, it's still pretty cool. one of our absolute favorite parts of rome - and the trip in general - was seeing the vatican and st. peter's basilica. nothing truly prepares you for how ornate, beautiful and special this place really is. if you decide to go (which you should), do a little research about the day/time you're thinking. we decided to get up early and get on the first tour available. this worked out well and we avoided the insane crowds that come late morning or early afternoon. this stop on our trip was extremely meaningful to us and i don't think i'll ever get over seeing the sistine chapel and every other beautiful inch of the vatican. just wow. this hallway had so many intricate, beautiful maps with one of the prettiest ceilings I've ever seen. the gates in the narthex of the basilica act as the holy door and are only open during jubilee years of the catholic church. i think i audibly squealed when I saw that the original pieta was in the entryway. i studied it in art history years ago and couldn't believe such a famous sculpture was just right here! it's hard to show or explain how enormous and ornate the basilica truly is. we visited on a monday, but they were already setting up the chairs for the pope's weekly papal audience on wednesday! st. peter's square! the building on the right is st. peter's and the obelisk on the left is the only one in rome that has not toppled since ancient roman times. being in rome and getting to see so many historical places and objects was an experience of a lifetime. we originally thought it was going to be super touristy (which parts of it definitely are), but it's all about where you go and what kinds of neighborhoods you explore. * rome is a big walking city. while you could take an uber or taxi to your next stop, consider walking or renting bikes. it's a great way to see everything! * we downloaded a few of the rick steves audio tours and they were extremely insightful and informative. just download on your phone over wifi, bring some headphones and go to town! he has a bunch for other european cities as well. * italy is known for making all the good carbs (looking at you, pizza, pasta & foccacia) but the wine is also out of this world. the best part is that you can order the house wine at most restaurants and it's extremely inexpensive and delicious too. * one afternoon we went to villa borghese park and rented a two-person pedal bike. hilarious, fun and a great way to spend some time in the shade and see a quieter side of the city. * some friends of ours were on their honeymoon in italy the same time we were there and we met them a few times in the trastavere neighborhood. we HIGHLY recommend venturing over to this area for some unique bars, adorable little cafes and some eclectic people watching. * gelato is always a good idea. cheers to a wonderful first stop in rome! next stop: firenze!